Successfully Added AMD and Intel CPU Cooler - Fan plus Aluminum Heatsink to your Shopping Cart. Efficient AMD and Intel CPU cooler for desktop computers. The CPU is a vital component inside your PC system. The care of a systems core CPU can very well determine the performance and longevity of today's desktop computers. Modern custom built computers and even mass produced computer systems contain ultra-fast CPU that run hotter than ever. In order to keep your system up and running it requires efficient heat dissipation to ensure the primary internal components (CPU + motherboard) do not overheat. The CVFW-CH03 fan with aluminum heat sink is a vital component for todays hard working desktop computer. By achieving the maximum cooling potential, this specially designed CPU cooler with aluminum finned heatsink will help to efficiently dissipate excess heat away from the CPU core to ensure longevity. Significantly more efficient than the stock cooler supplied by CPU manufacturers, this cooling solution is a simple, practical and extremely effective way to protect your investment and is also useful for those people who like to do CPU over-clocking. 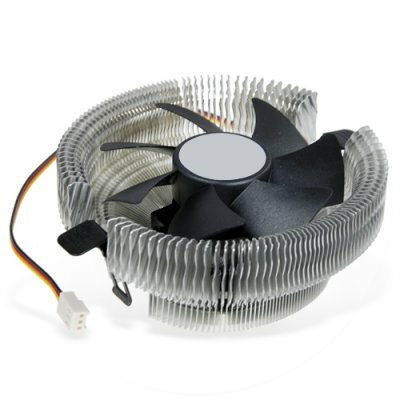 The heatsink fans uses an optimized design to offer maximum surface area and therefore maximum cooling. This CPU cooler would be ideal for retrofitting onto computers with Intel LGA775 socket CPU's. The cooler is also compatible with AMD CPU's that include Socket 754, Socket 939, Socket 940 and Socket AM2. We are offering this great new computer accessory in an order quantity of at least 10 pieces in order to give you the absolute best re-sale profit margin from our low wholesale price and even better shipping rates. Efficient CPU cooling solution to preserve CPU longevity and maximize system performance. Aluminum cooling fins quickly conduct heat away from CPU core so the heat can be dissipated into the air.